Anthony Bourdain – yes he is a legend and his recent death upset food-loving travelers across the globe. I wasn’t his biggest fan and certainly didn’t agree with enthusiasm for eating animals, but he was an influential personality and I’m sure he awakened a love for good food and travel in countless people. 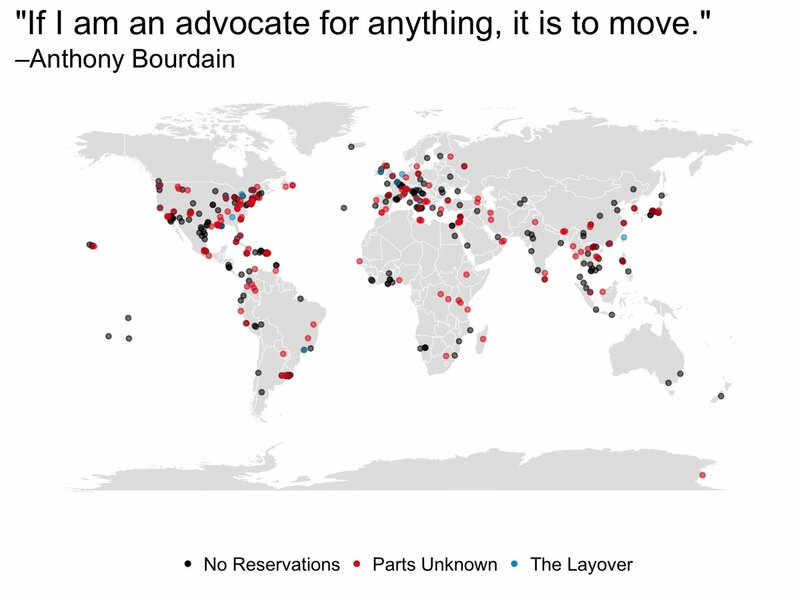 A simple map that people can easily recognize and that depicts how far and where Anthony Bourdain travelled for his different TV shows. I felt the data and Anthony Bourdain’s legacy warranted more of a story and not just a simple viz like I usually create them. So I decided to characterize the four shows a little bit, and highlight the places visited with small maps.